In 1909, W. A. Lanterman, L. N. Cary, C. L. Timmerman, E. H. Hugh and T. A. Cummins spearheaded week-long fund drive to establish a modern hospital in the 29-year old city of Mandan. The effort was successful, resulting in the formation of a stock company, capitalized at $50,000, with 100 stockholders including 50 area farmers. In August 1909, stockholders announced the Heartview Addition location of Mandan's new hospital. The meeting was held in the Business Men's Club rooms at the InterOcean Hotel. Other sites considered were in the First Northern Pacific Addition and the Helmsworth and McLean's Addition. "The Heartview location will certainly make an excellent location for the magnificent $30,000 building ... The site is surely a fine one for any public institution , situated on the slope of a hill facing south, in the west end of the city, right in the heart of what will eventually be one of the best residence districts of Mandan," reported the Mandan Pioneer Newspaper. The construction contract was awarded in October 1909 to C.E. Wierschke of Glenwood Wisconsin for $22,400. The building was finished in 1910, and opened for business June 11. Mandan's first formal hospital was a three story brick building constructed on the western edge of town. The hospital had 12 private rooms, 10 double rooms and a large ward, besides apartments for attendants and employees. The eight doctors practicing in Mandan were given initial medical privileges. Seven registered nurses would staff the facility. The third floor was originally expected to be used to establish a three-year nursing school. In 1918, it's operation was taken over by the area's Methodist Churches and provided services to patients of all faiths and renamed "Deaconess Hospital." 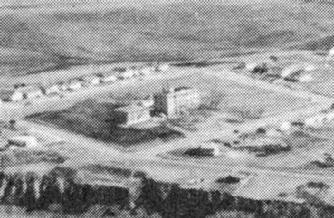 In May 1936, a new annex and nurses home was dedicated to the building at the cost of $12,500 (or $195,000 in 2010 dollars) to accommodate Mandan's growing population and to assure adequate nursing staff for the hospital. 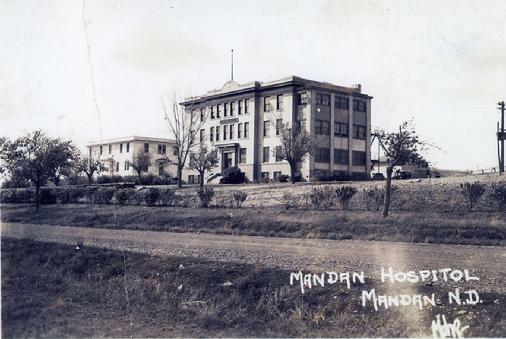 Later, control of the operation and the building was turned over to the City of Mandan, and operated on a non-profit basis and renamed "The Mandan Hospital". In June 1961, with 91.8% "Yes" vote, Mandan residents overwhelming approved a $400,000 bond issue (or $3 million in 2010 dollars) for a new hospital building. Originally planned as a 56-bed facility $950,000 ($6.7 million in 2010 dollars) project, the building opened operation as a modern 63-bed facility on September 9, 1963. A five-doctor clinic was added in 1964. An exchage was provided to the facility off Interstate-94 four lane highway when it was constructed in 1965. The Heartview Alcoholism Treatment Clinic purchased the former Mandan Hospital and adjacent nursing home buildings in November 1963 and converted it into a 40-bed treatment facility offering both in-patient and out-patient services. As the only facility of its type between Minneapolis and Seattle, both services and size expanded. In 1978, a addition brought the in-patient capacity to 76-beds but included the demolition of the original building. The 16-bed adolescent unit completed in 1986 brought the facility to its peak size at 91 total in-patient beds. Heartview served patients from across the United States and Canada. Now operating as the Heartview Foundation, financial challenges forced their operation to downsize and the program relocated to Bismarck in 1996. The building was purchased by HIT, Inc. which countinued to expand services to individuals with physical or development disabilities. HIT moved its operation to a new expanded facility in north Mandan location in 2012. The building is now owned by ND Teen Challenge.